Entebbe — President Museveni yesterday described his ministers as "sleepy and selfish" people who do not listen and do not act on issues affecting investment in the country. Yesterday's PIRT attended by both local and foreign investors focused on six thematic areas of tourism, agriculture and value addition, oil and gas; competitiveness, transport, and, mineral value addition. "Many of my ministers are sleeping. They are selfish and only think about themselves. 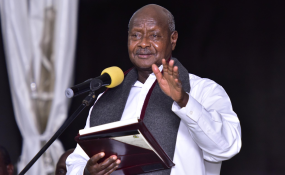 Ugandans know how to listen if they are told the right things, that is how we managed to build the Movement by learning and listening to others," Mr Museveni said. The President's strident remarks followed a statement by Agriculture State minister, Mr Christopher Kibanzanga that the agricultural sector in Uganda is being developed in a "private-led" system and the government can only help with research and extension services. "Seventy per cent of the districts have extension workers but they are not being used by the investors," Mr Kibanzanga said in response to accusations that his ministry has failed to guide investors on profitable enterprises. Mr Muhamood Hudda, the Consular General of Bangladesh in Uganda, in a paper on Agriculture and Value addition, said that the Agriculture ministry had not done enough to brand and market Uganda's agricultural products globally. "Uganda needs to put its house in order to compete in the value addition. The Ministry of Agriculture needs to modernise before farmers do," said Mr Hudda, himself a flower export. Asked at a press conference why President Museveni was not firing ministers he appoints if they were sleeping on the job, he said: "It is not only the ministers that are sleeping, but even other Ugandans." The chairman of the Uganda Chamber of Mines and Petroleum Mr Elly Karuhanga, said investors targeting Uganda's oil production have failed to budget for their investments in the sector because of uncertainty.